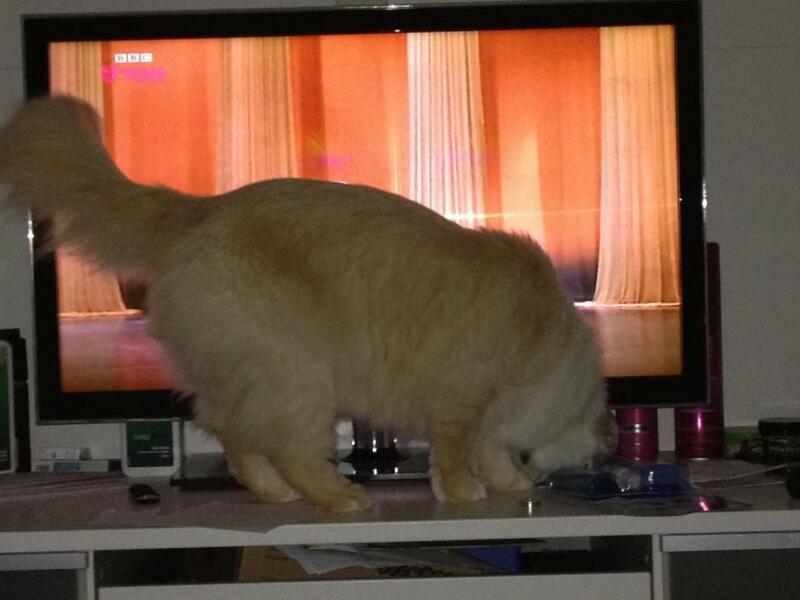 Detailed on the Buddy Media blog this week, a man living just outside of London turned to Facebook for help when attempting to locate his lost cat. 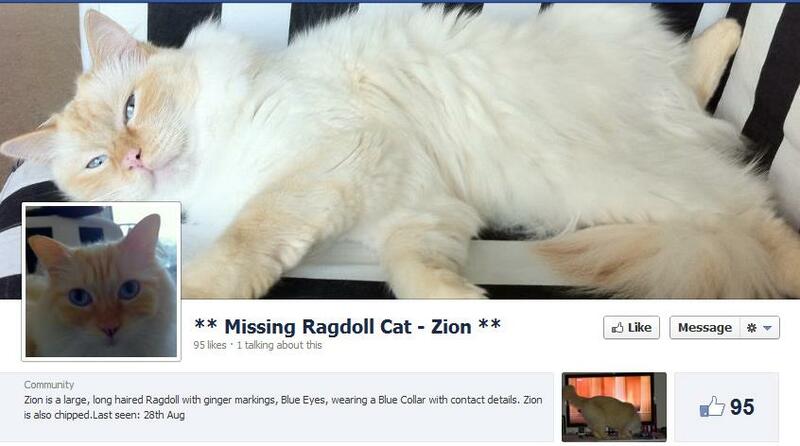 On Tuesday August 28, James Woodley, a Salesforce web developer, came home to discover that his Ragdoll cat named Zion had gone missing. With the help of his girlfriend and roommate, the trio went door-to-door within the immediate neighborhood looking for the cat. They also placed flyers in local shops with contact information in case anyone spotted Zion wandering around the local area. Unfortunately, none of these methods worked and Zion’s whereabouts remained a mystery to Woodley. Turning to Facebook for support, Woodley created a Facebook page to help spread the word through social media in addition to providing more information about the lost feline. For instance, the info section of the page included identifying information about the fur color, eye color and collar color as well as a picture of Zion. Woodley also mentioned that the collar included his phone number and that Zion was micro-chipped. After getting his immediate friends to like the page, Woodley started to look into purchasing Facebook advertising that was geographically limited to his area of Chelmsford, England. When asked about the advertising, Woodley said “I purchased two ads, targeted to people in Chelmsford. Facebook estimated that the reach of the ads was 60,000 people.” On Facebook, any user can purchase advertising that mentions a specific page post or advertises the page itself. In this case, Woodley’s intention was to spread the information about his lost cat vastly quicker than knocking on doors or posting flyers. For the vast majority of people in Chelmsford, the ad likely appeared on the right side of the Facebook layout next to the main news feed. 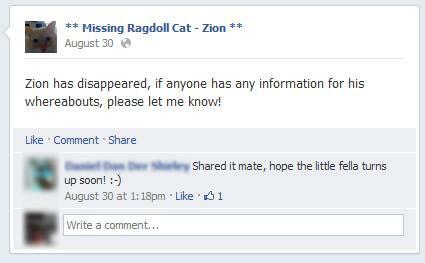 Approximately thirty minutes after the advertisement went live on Facebook on August 30, Woodley received a message through the Facebook page from a woman that had spotted Zion. After seeing the advertisement on Facebook, the woman recognized Zion’s picture and sent Woodley her contact information. When Woodley called the woman, she told him where she spotted Zion a couple days earlier walking along a road in Chelmsford. Regarding Zion’s location, Woodley stated “The girl told me that she thought Zion had been run over, because she saw him, on the day he went missing, in the middle of the road, and she tried to coach him to the side. Apparently he got scared and ran into the woods.” Based off the last location where Zion was spotted, Woodley and his friends visited the area to look through the nearby woods. After calling Zion’s name for a while, they were able to hear Zion meowing and found the cat stuck in a nearby ravine.